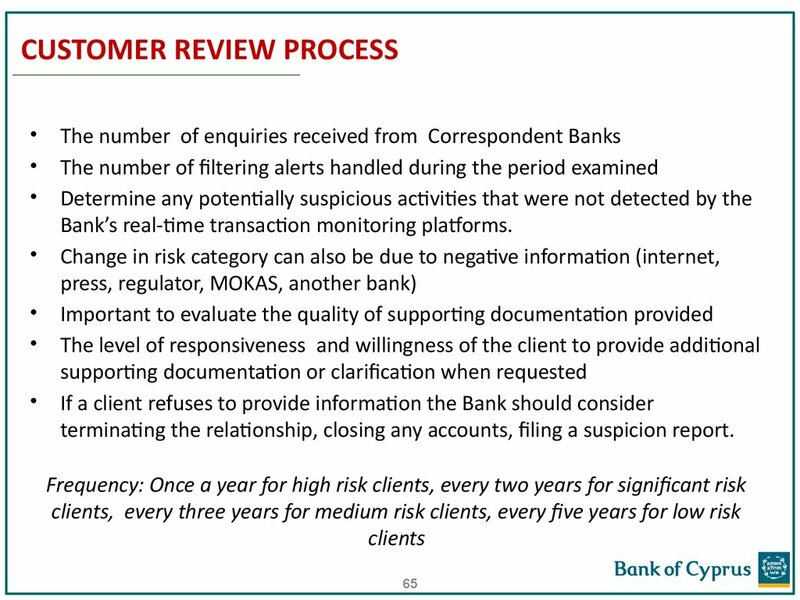 transactions conducted with a financial institution. 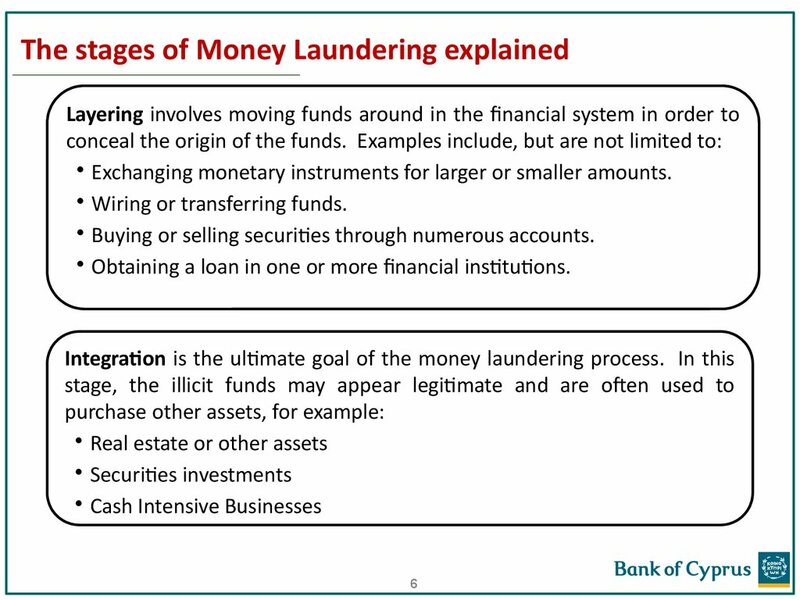 • Exchanging monetary instruments for larger or smaller amounts. 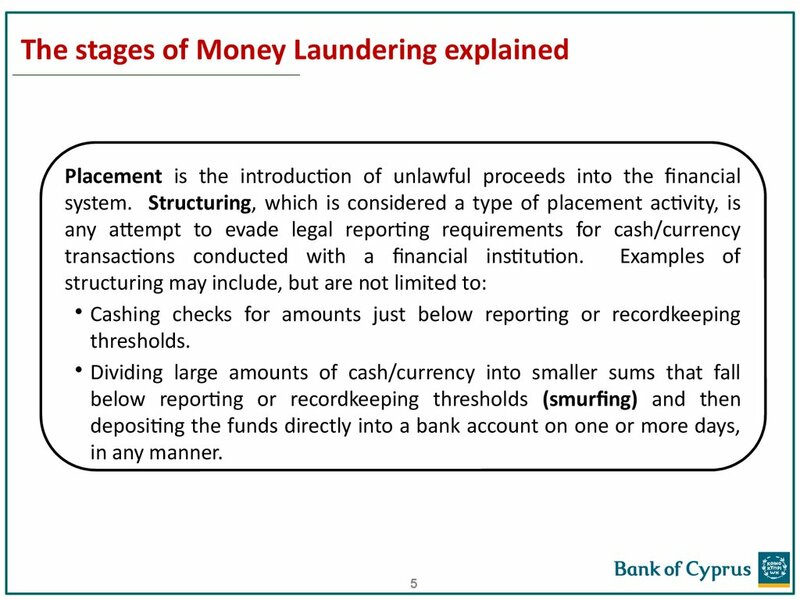 • Wiring or transferring funds. 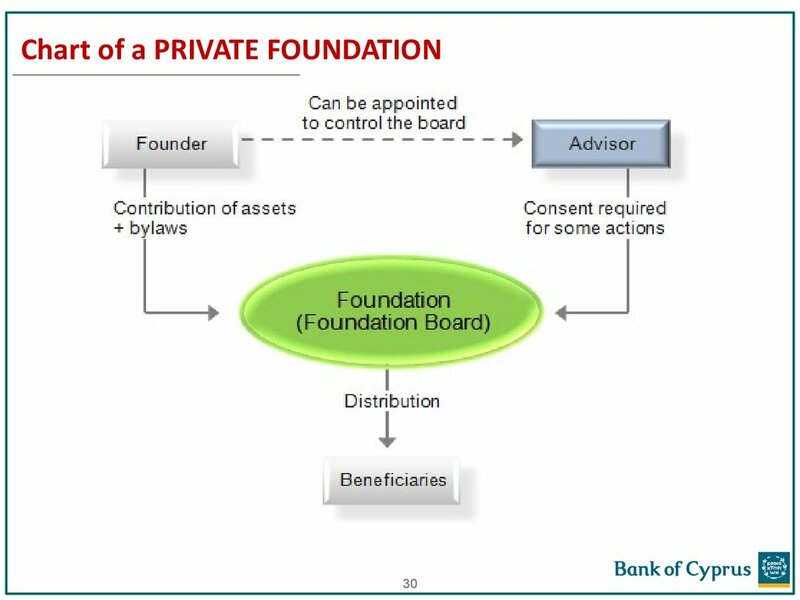 • Buying or selling securities through numerous accounts. 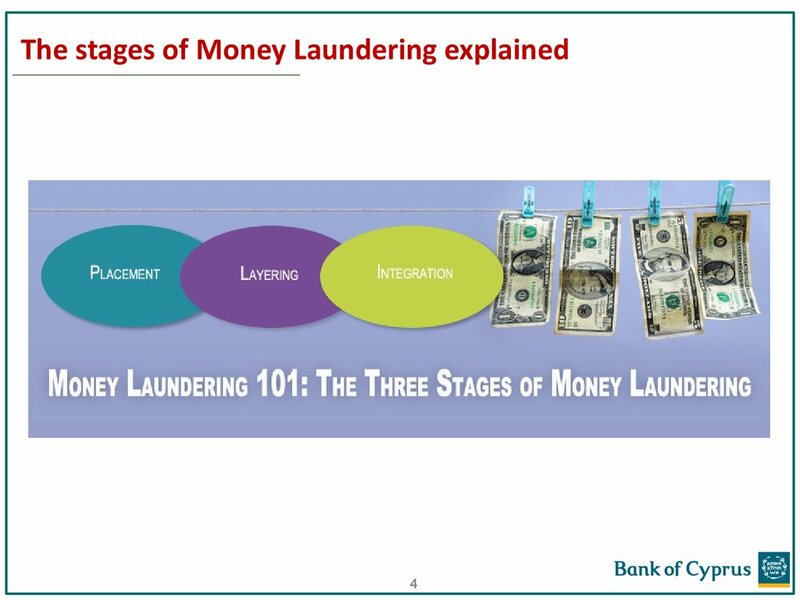 • Obtaining a loan in one or more financial institutions. 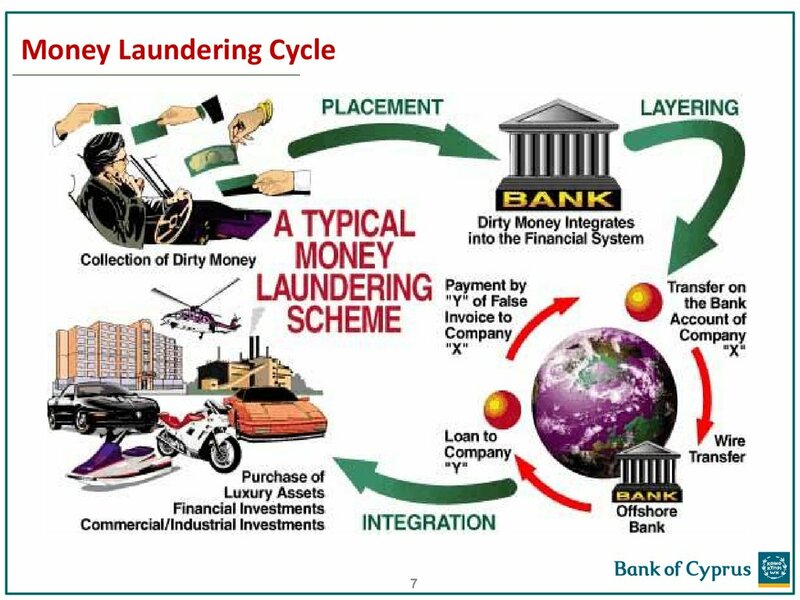 theft, financial fraud, money laundering and terrorist financing. 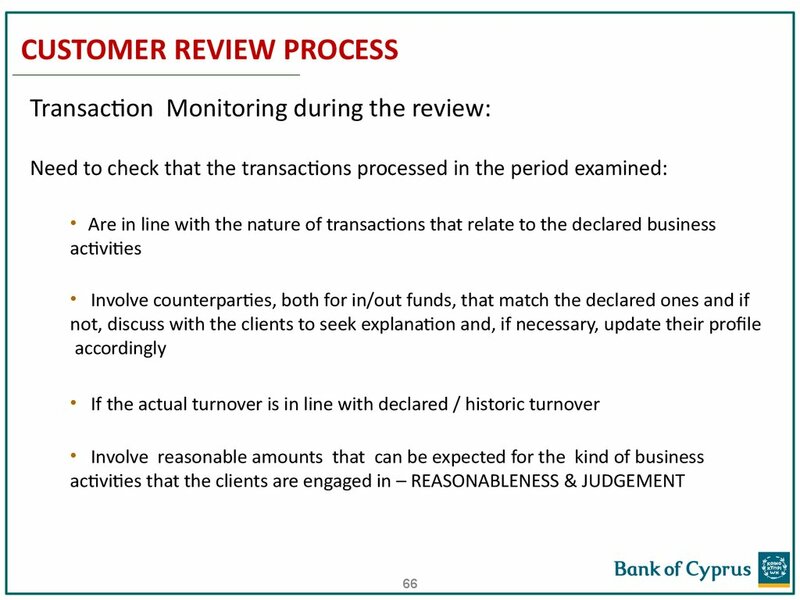 customer really is and what the expected relationship with them will be. 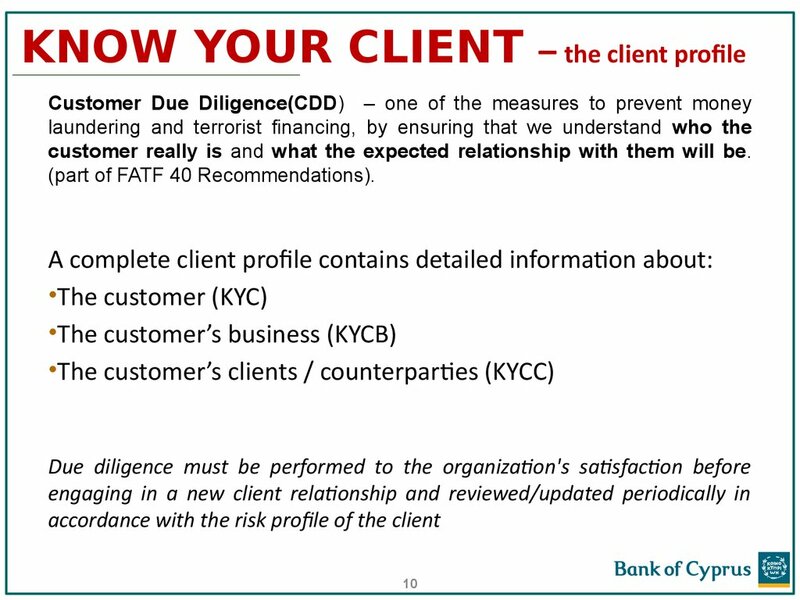 (part of FATF 40 Recommendations). 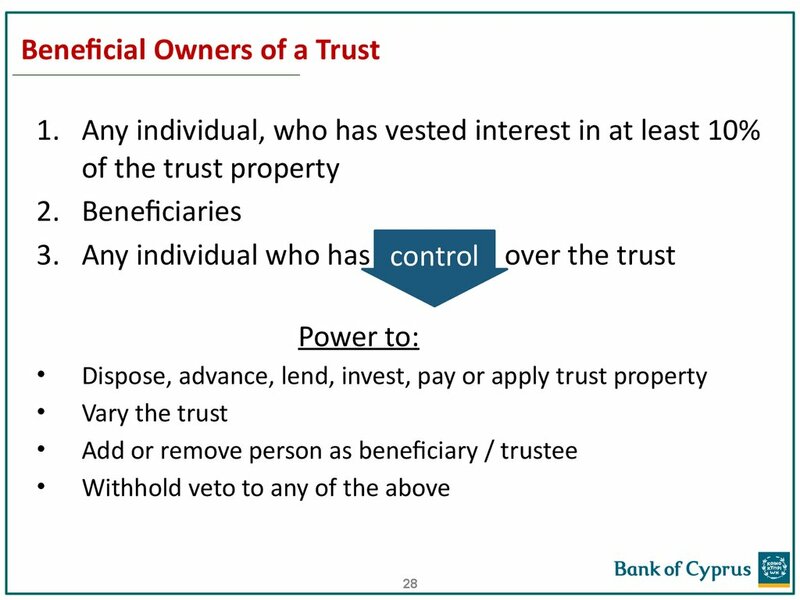 WHO IS THE ULTIMATE BENEFICIAL OWNER? 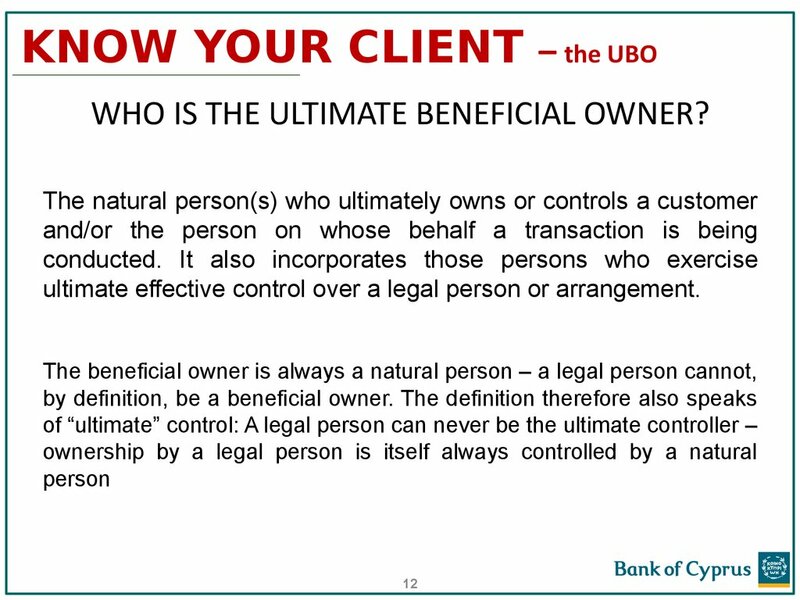 ultimate effective control over a legal person or arrangement. accepting them as a customer. 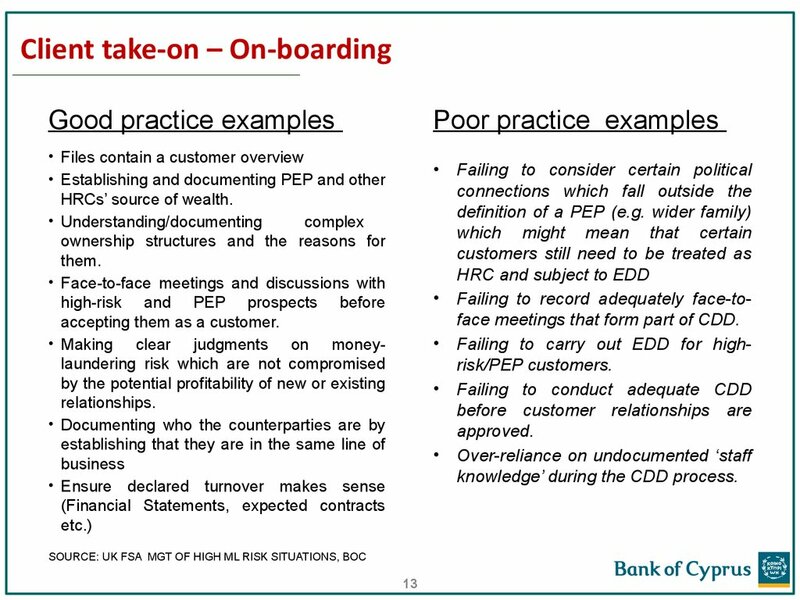 Failing to record adequately face-toface meetings that form part of CDD. 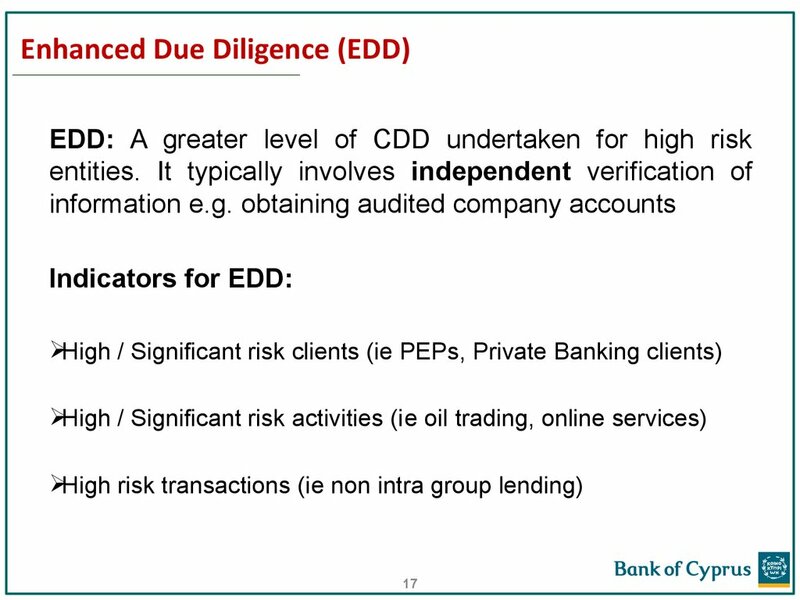 Failing to carry out EDD for highrisk/PEP customers. 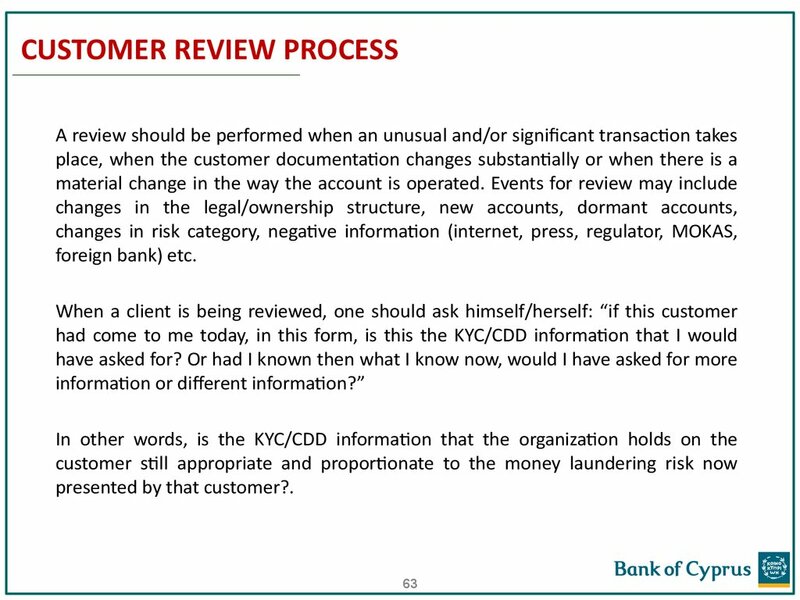 knowledge’ during the CDD process. 14. 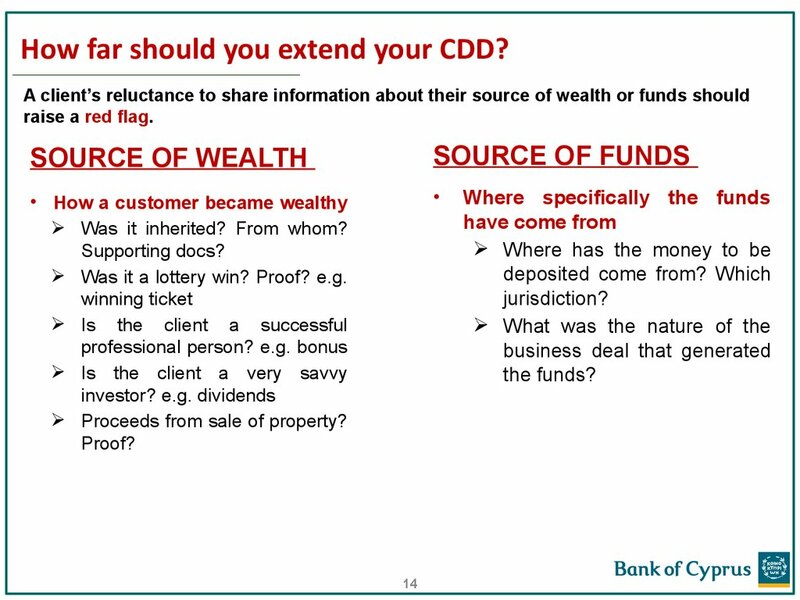 How far should you extend your CDD? Was it inherited? From whom? Was it a lottery win? Proof? e.g. 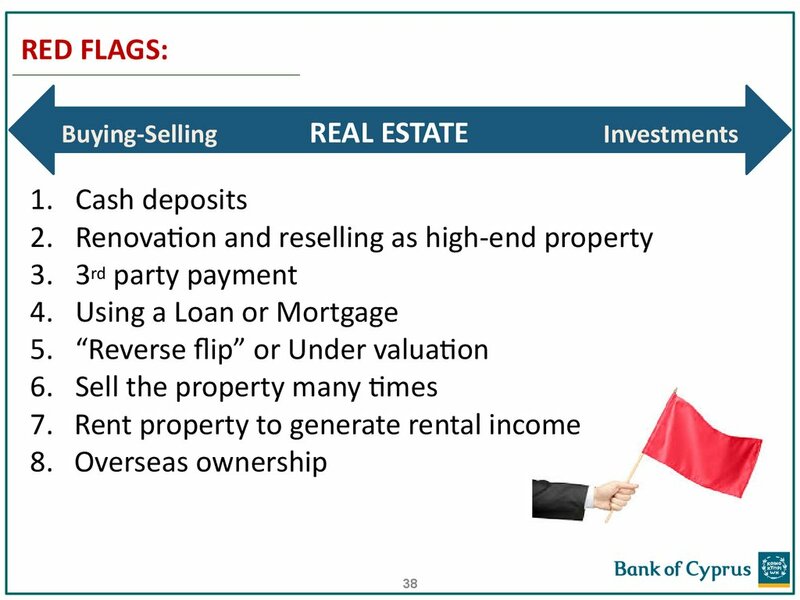 Proceeds from sale of property? 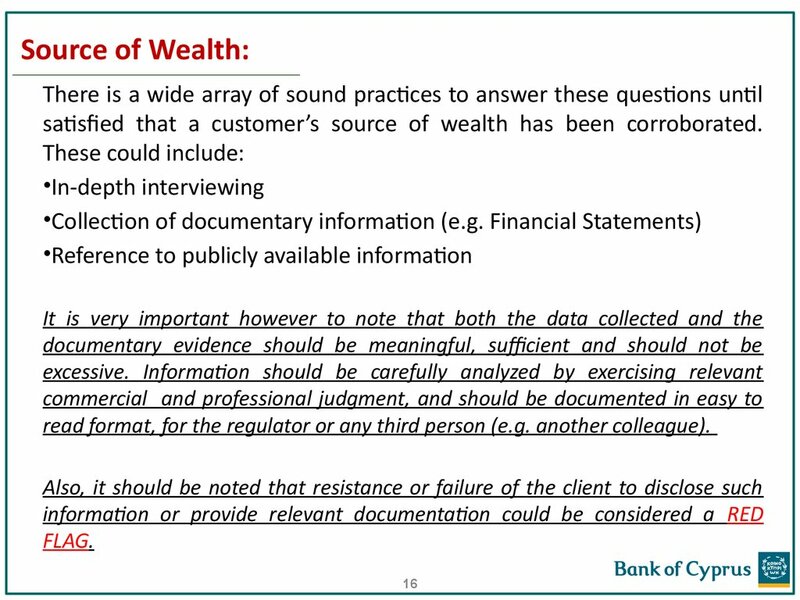 Generic source of wealth descriptions are not acceptable e.g. 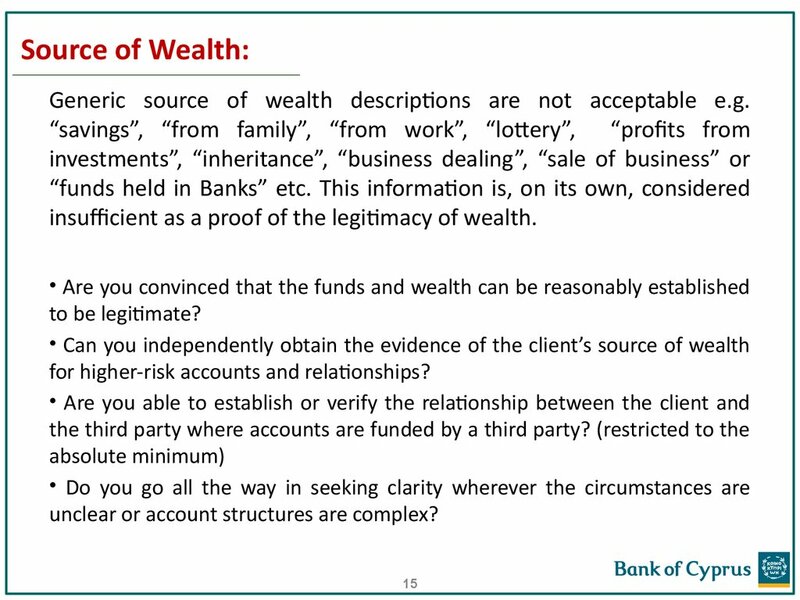 insufficient as a proof of the legitimacy of wealth. 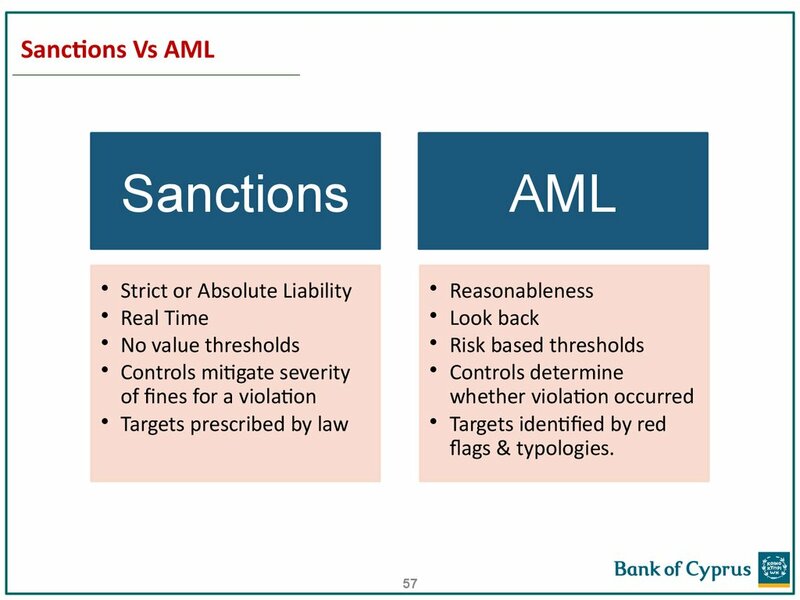 for higher-risk accounts and relationships? 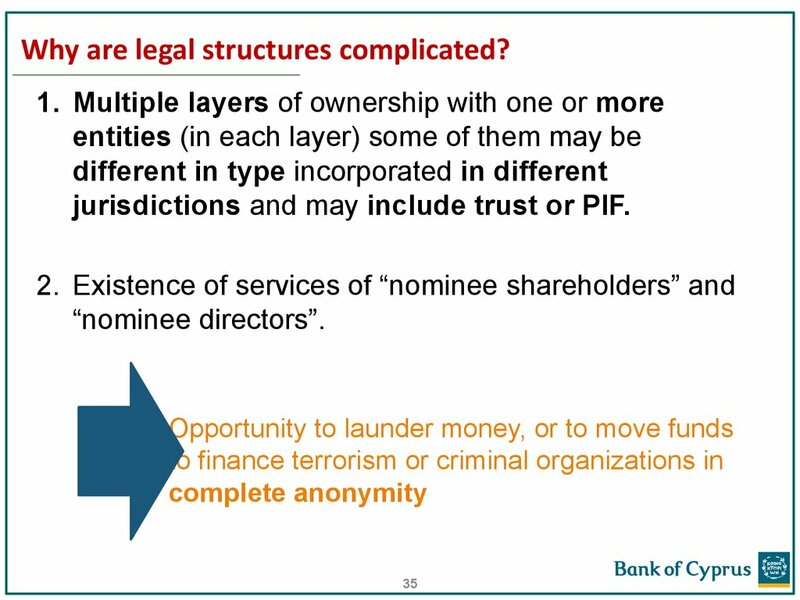 unclear or account structures are complex? 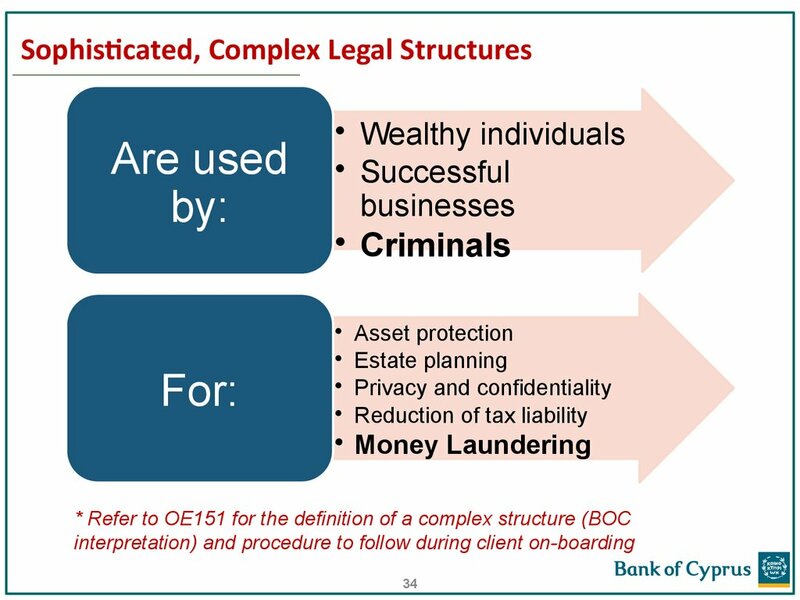 satisfied that a customer’s source of wealth has been corroborated. 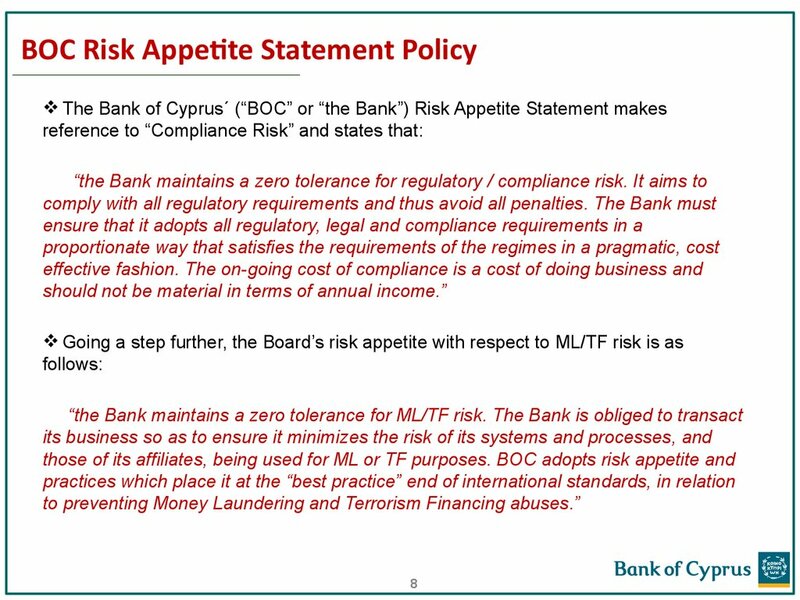 read format, for the regulator or any third person (e.g. another colleague). The above need to be updated at regular intervals. 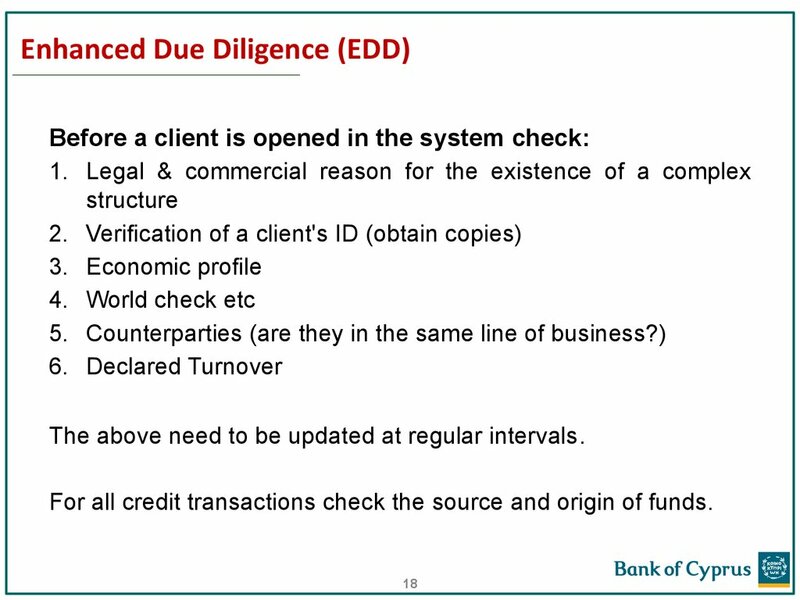 For all credit transactions check the source and origin of funds. 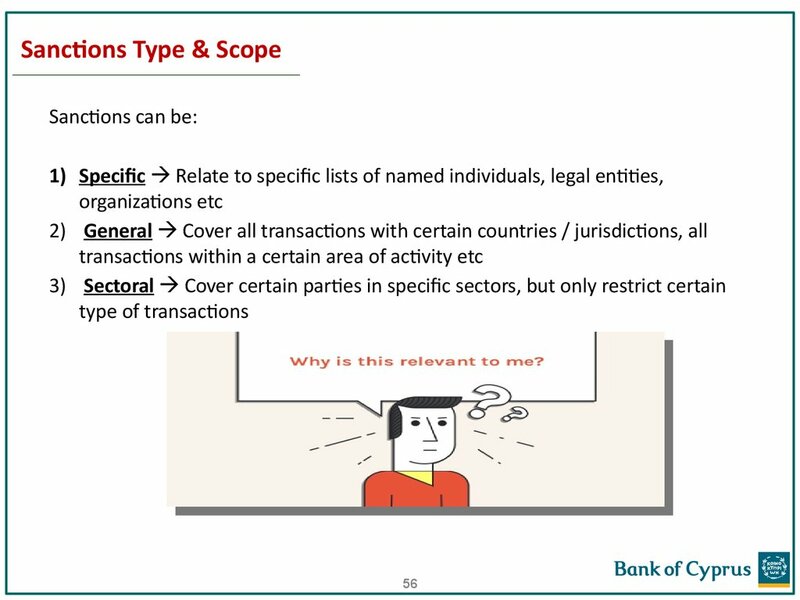 • Obtaining information on the reasons for intended or performed transactions. 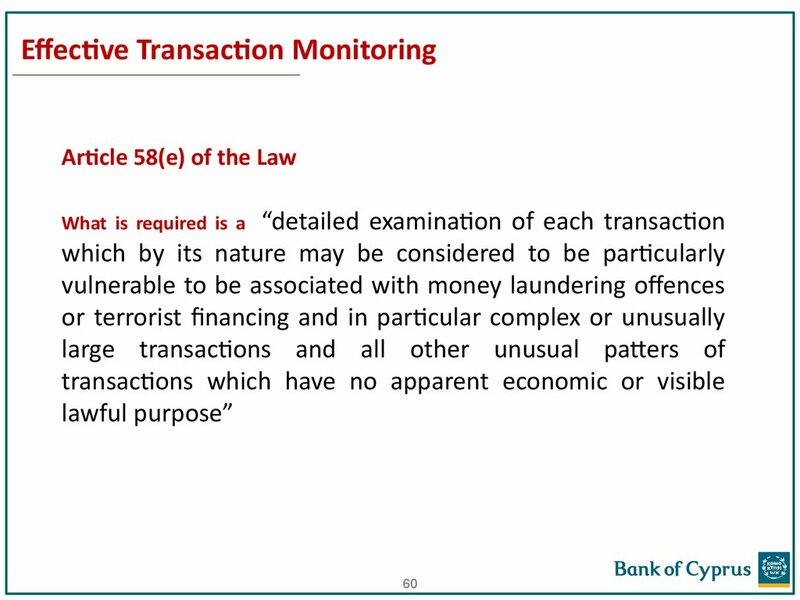 transactions that need further examination. 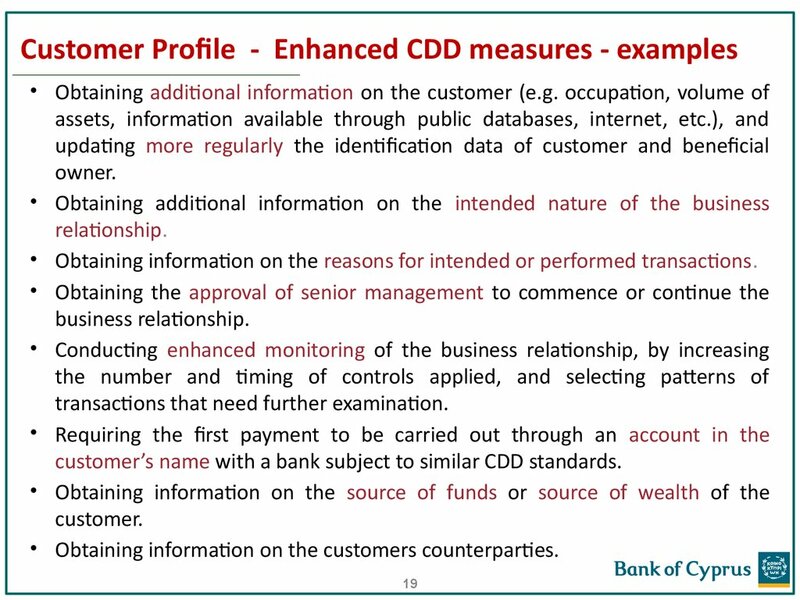 customer’s name with a bank subject to similar CDD standards. 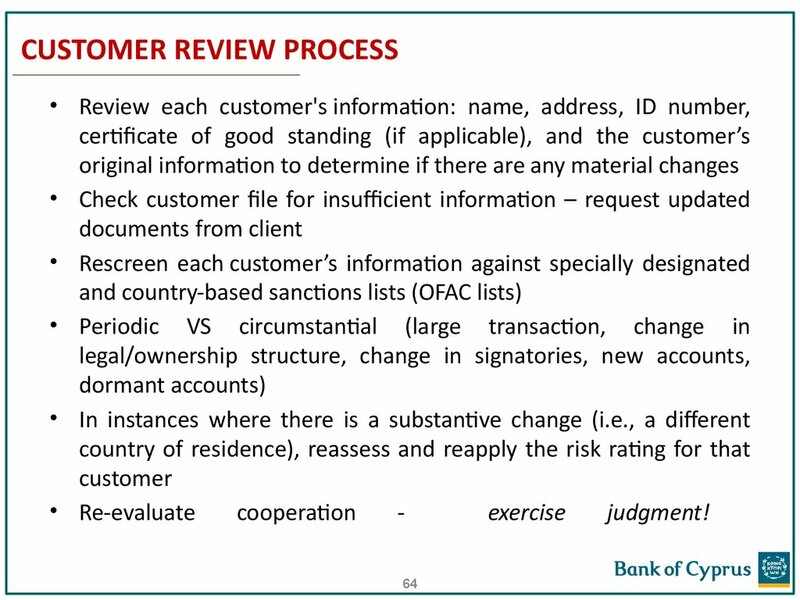 • Obtaining information on the customers counterparties. 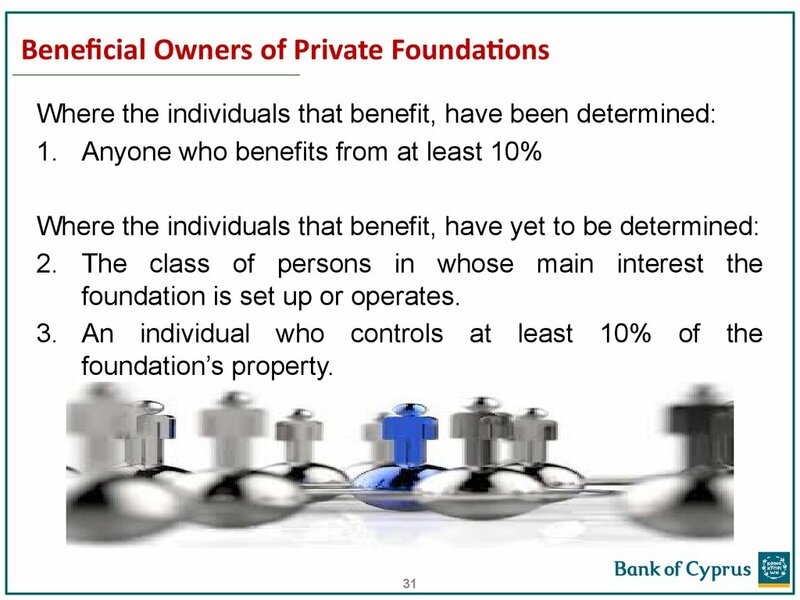 individuals in the foregoing categories. 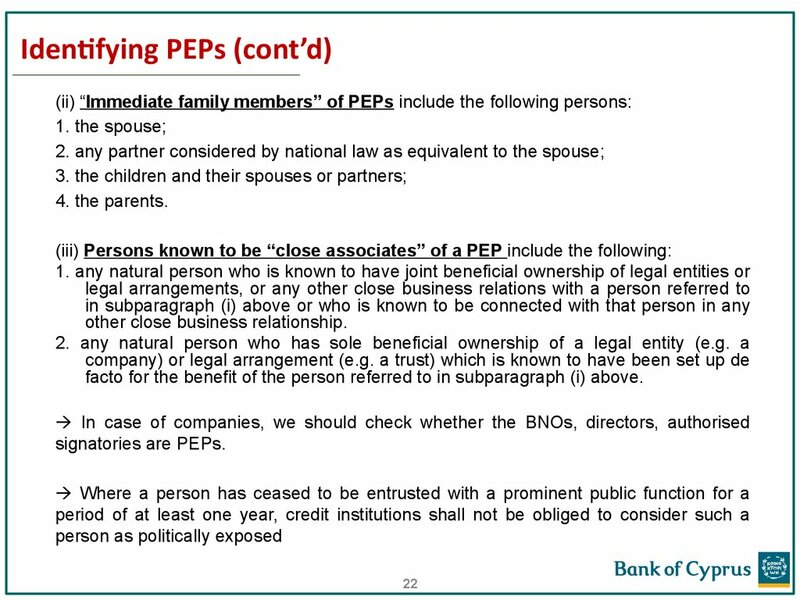 (consanguinity) or through marriage or similar (civil) forms of partnership. 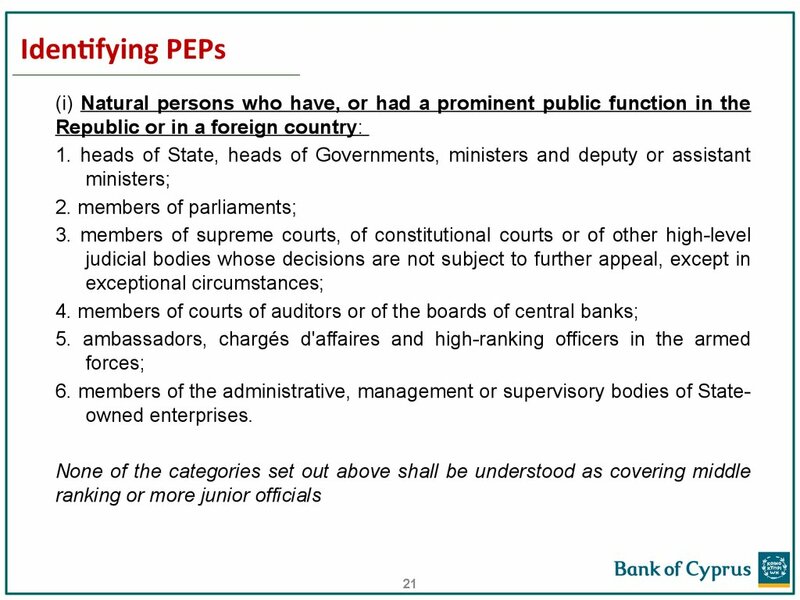 6. members of the administrative, management or supervisory bodies of Stateowned enterprises. 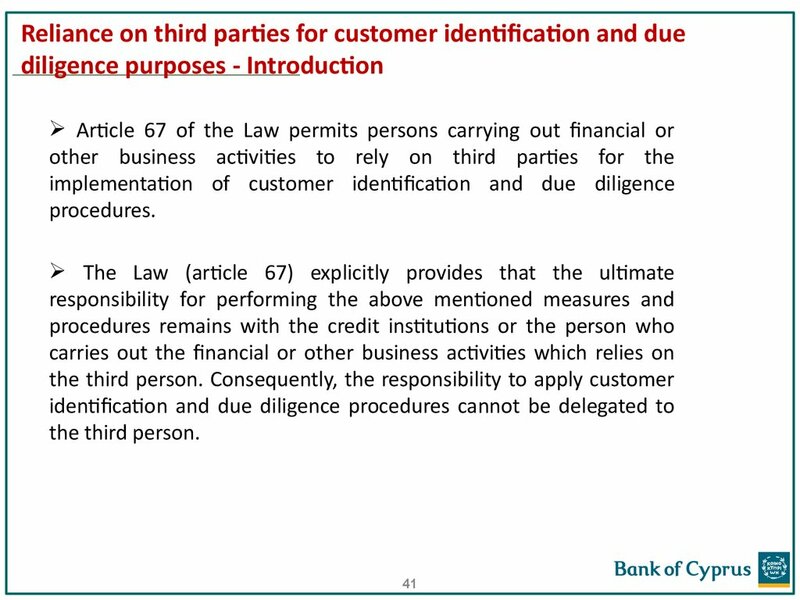 facto for the benefit of the person referred to in subparagraph (i) above. 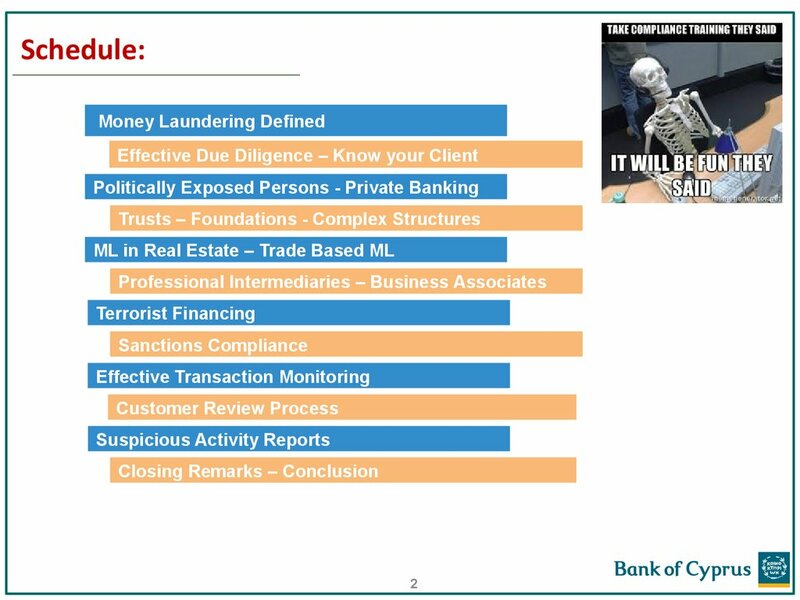 high risk and subject to enhanced due diligence. 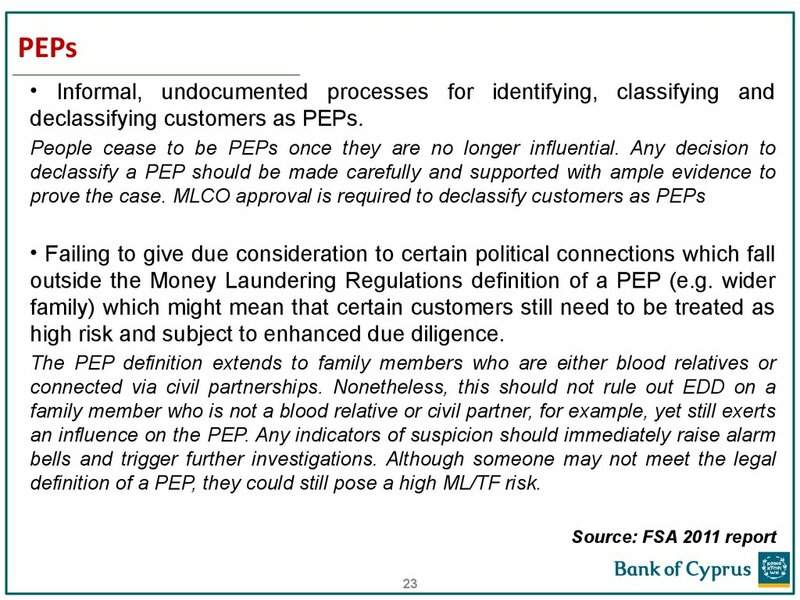 definition of a PEP, they could still pose a high ML/TF risk. 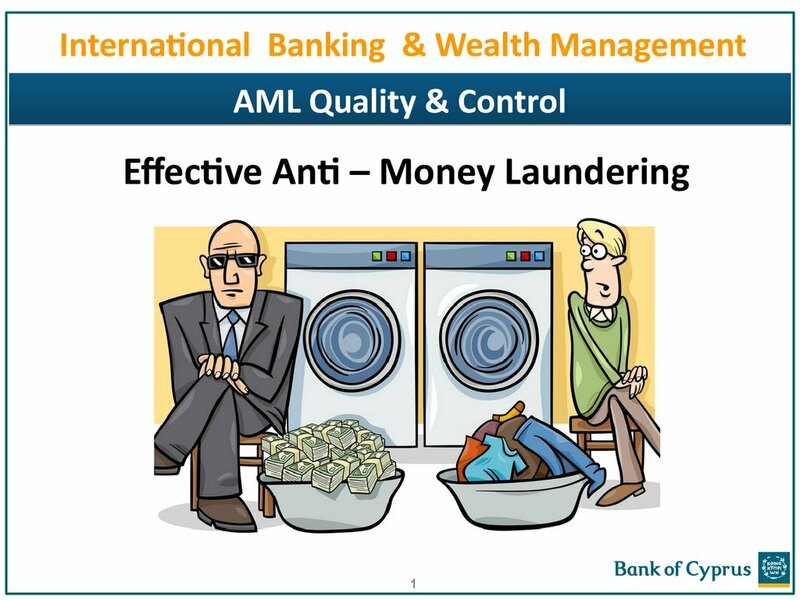 investment portfolio equal to or greater than EUR200k. 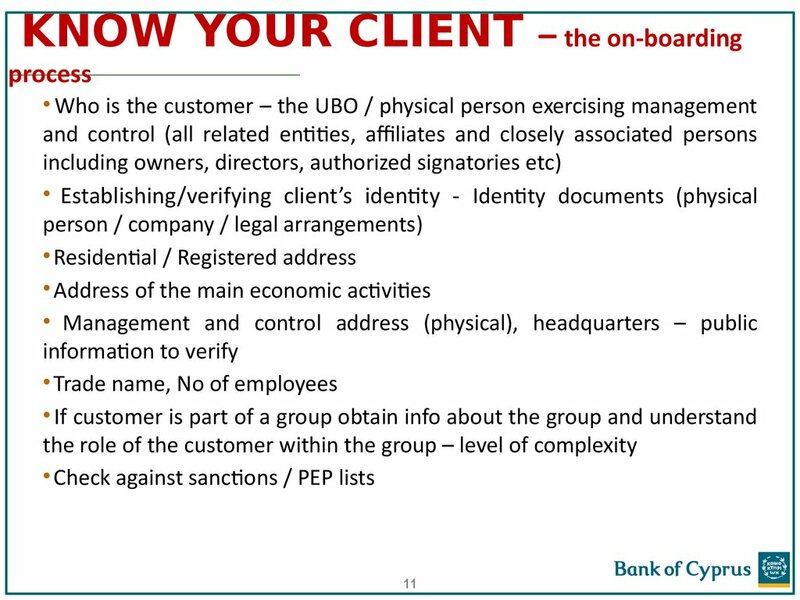 • The relationship managers becoming client advocates to protect their clients. 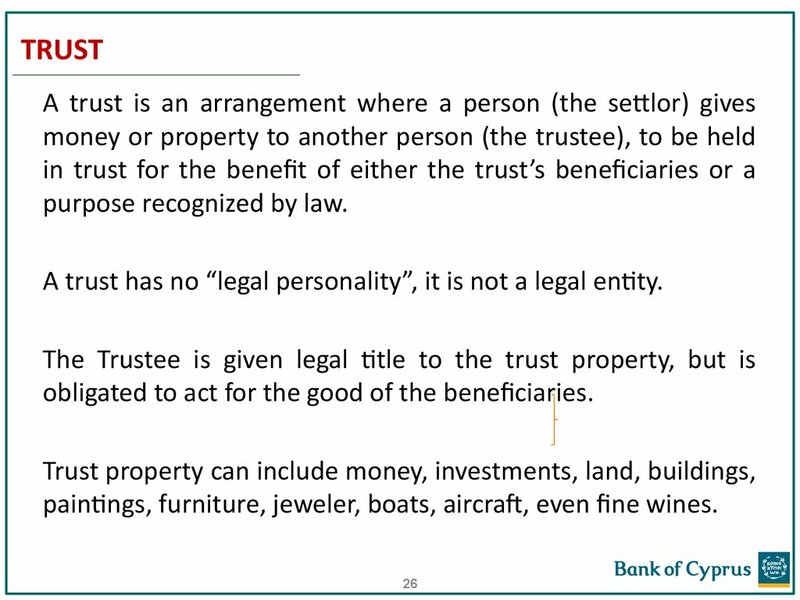 A trust has no “legal personality”, it is not a legal entity. obligated to act for the good of the beneficiaries. paintings, furniture, jeweler, boats, aircraft, even fine wines. 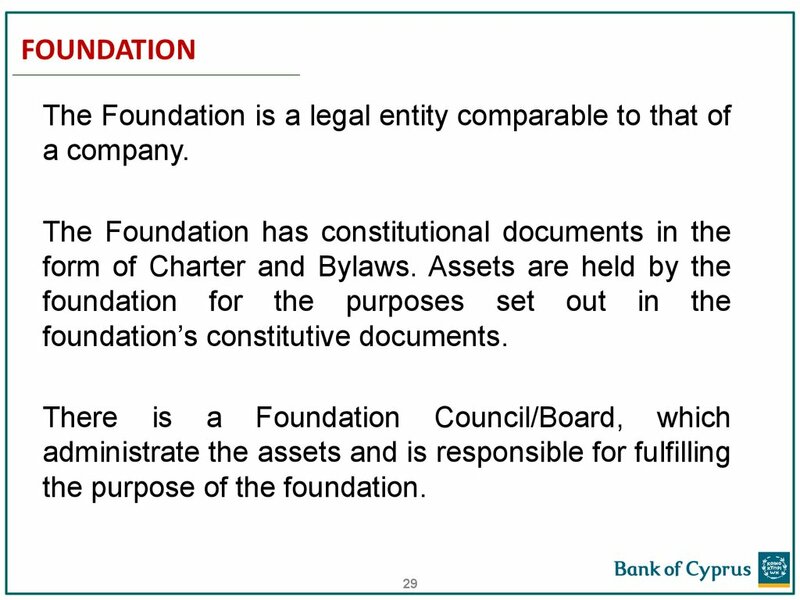 foundation is set up or operates. 35. 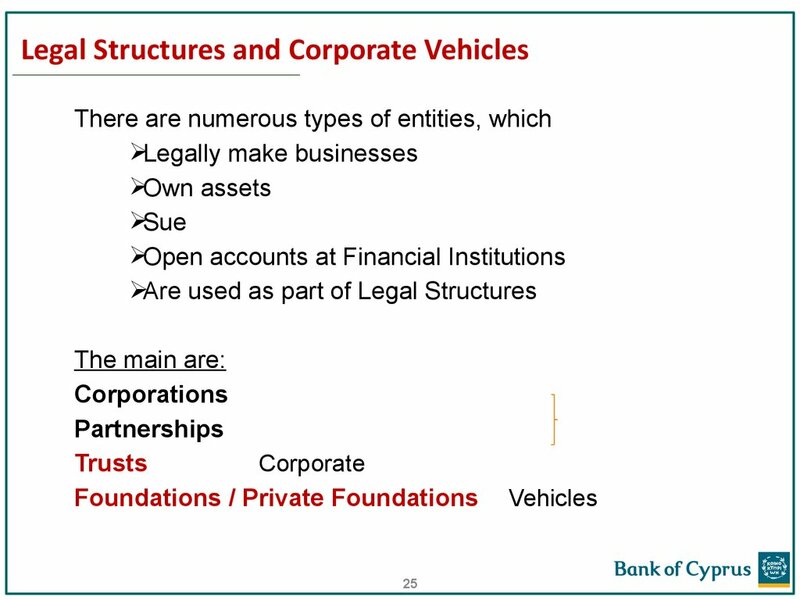 Why are legal structures complicated? 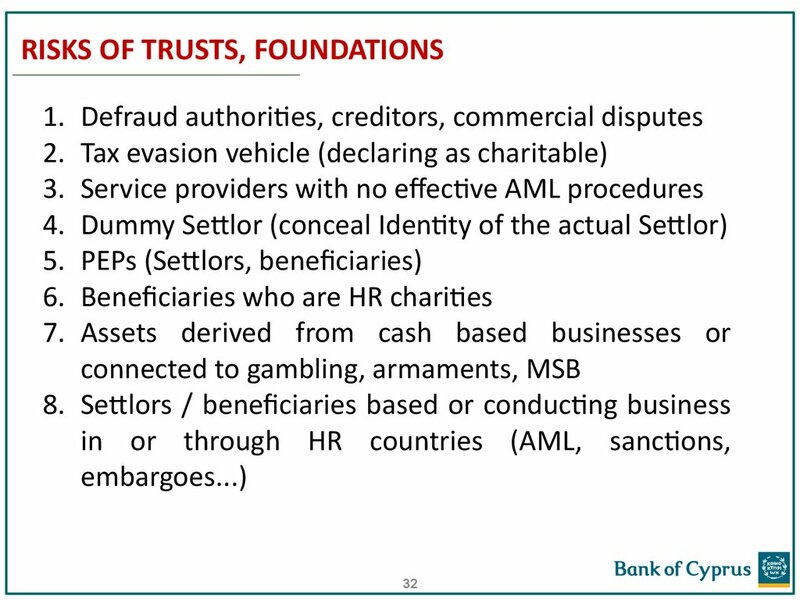 jurisdictions and may include trust or PIF. 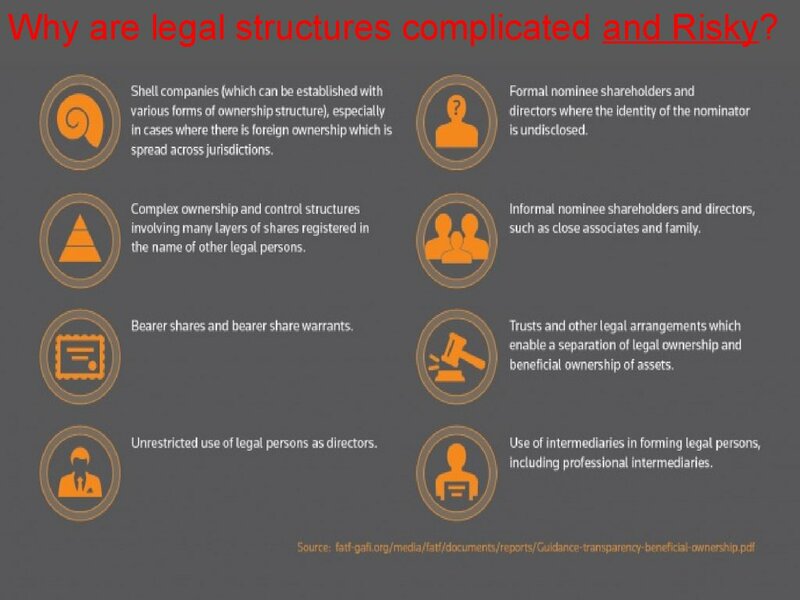 Why are legal structures complicated and Risky? 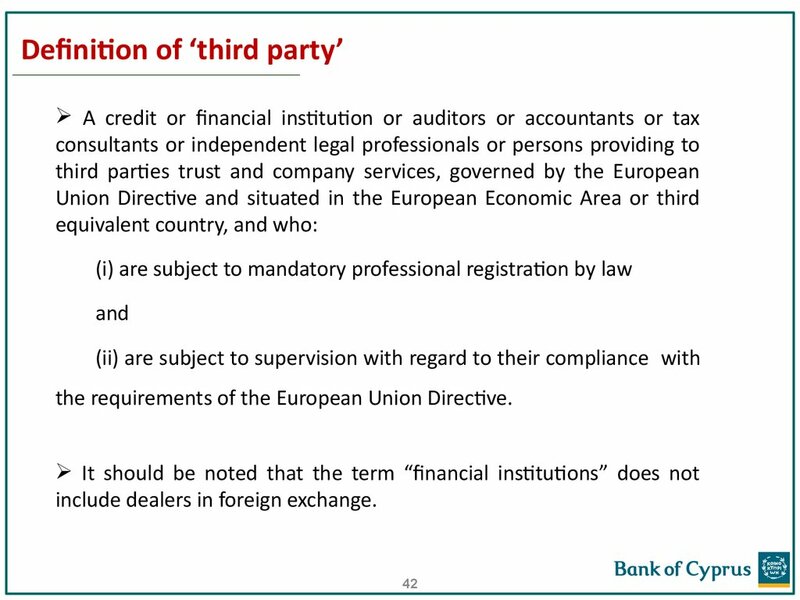 the requirements of the European Union Directive. 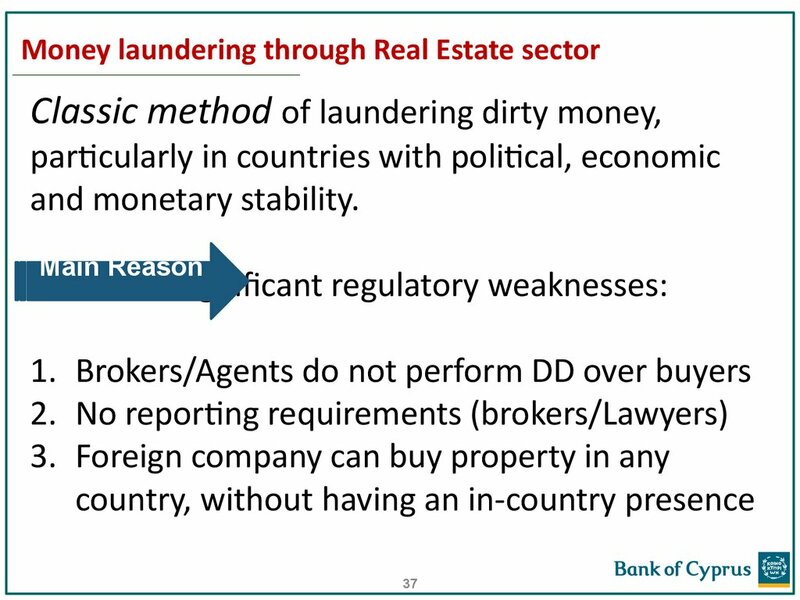 include dealers in foreign exchange. that are recorded in the relevant circulars. 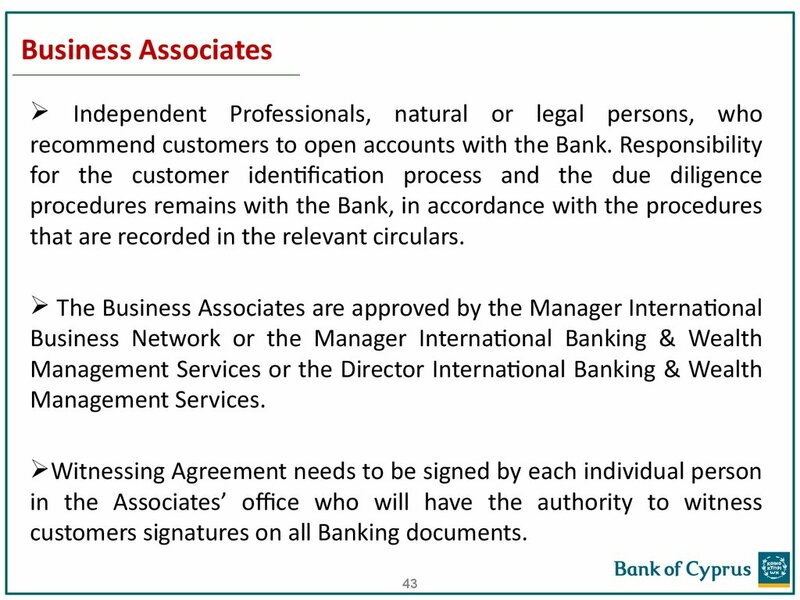 customers signatures on all Banking documents. to do or to abstain from doing any act. 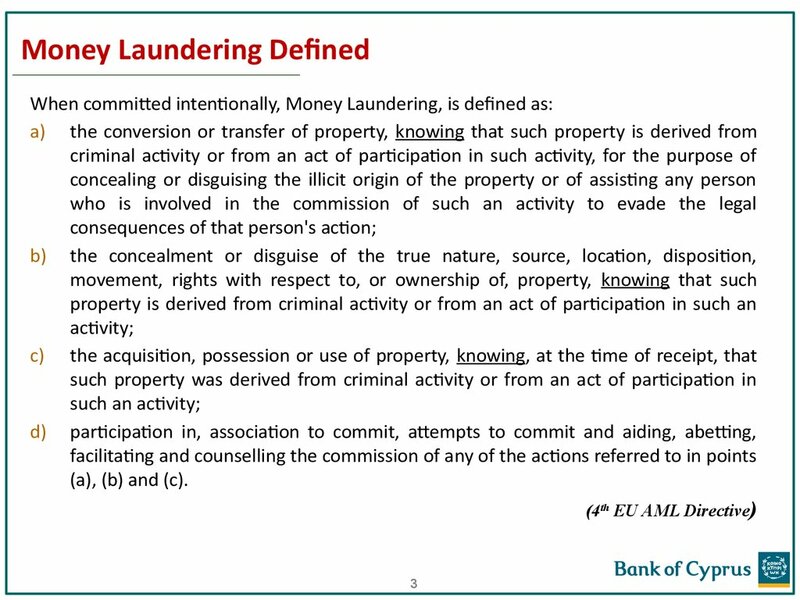 either illicit or legitimate funds directed towards a criminal purpose). 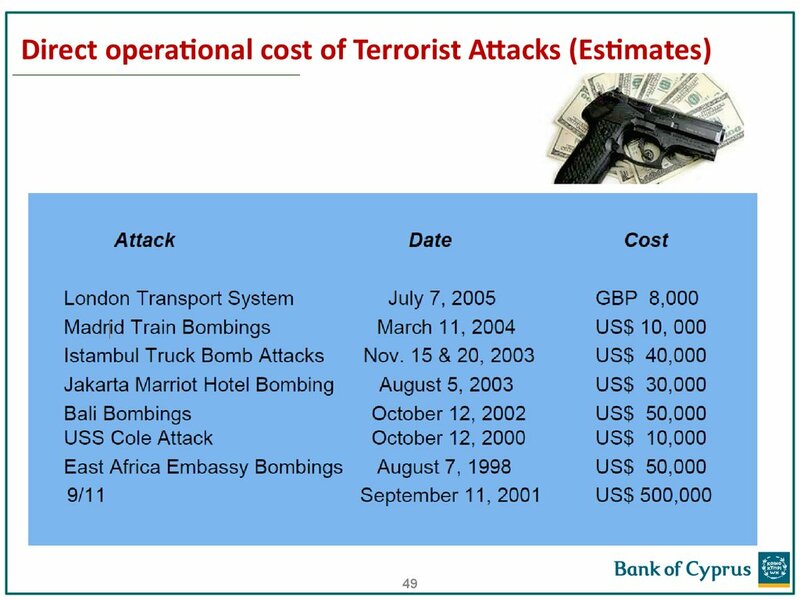 correspond to the stated occupation (e.g., student, unemployed, or self-employed). 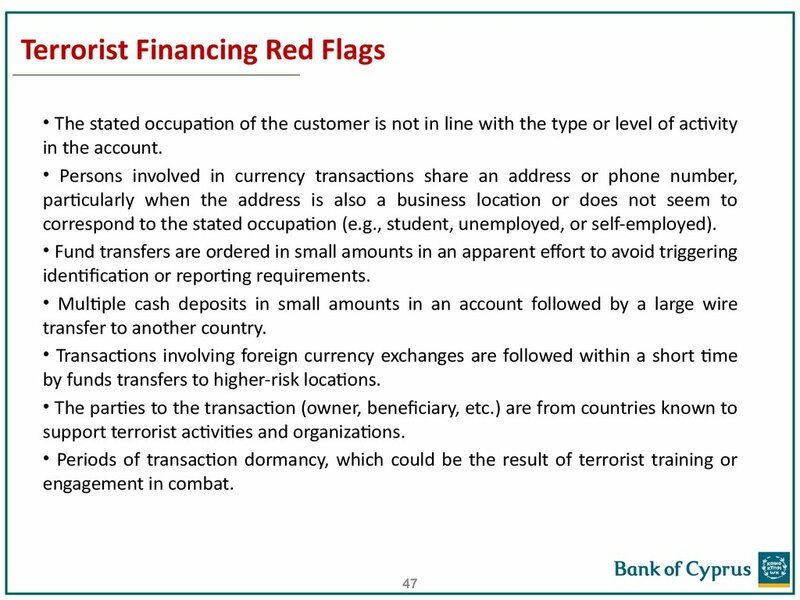 by funds transfers to higher-risk locations. 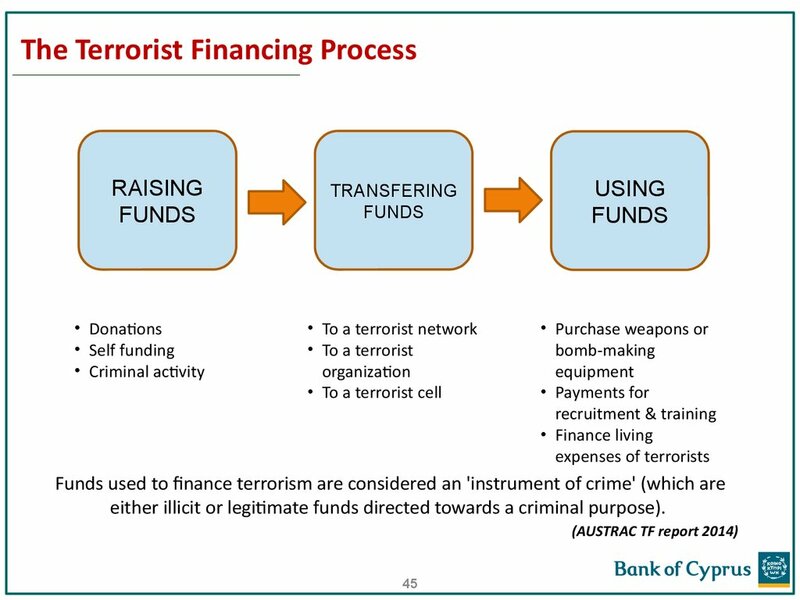 support terrorist activities and organizations. • Charitable activity in areas of conflict especially in Syria. 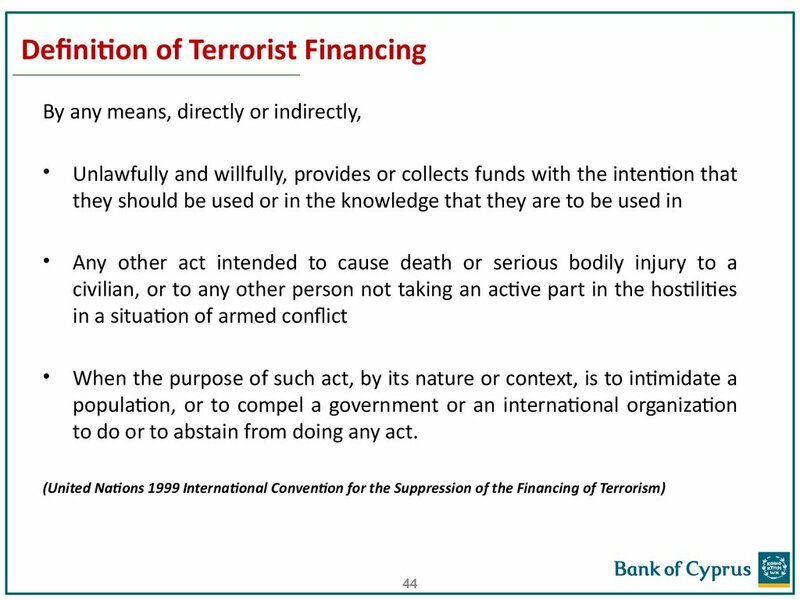 instability or known to support terrorist activities and organizations. 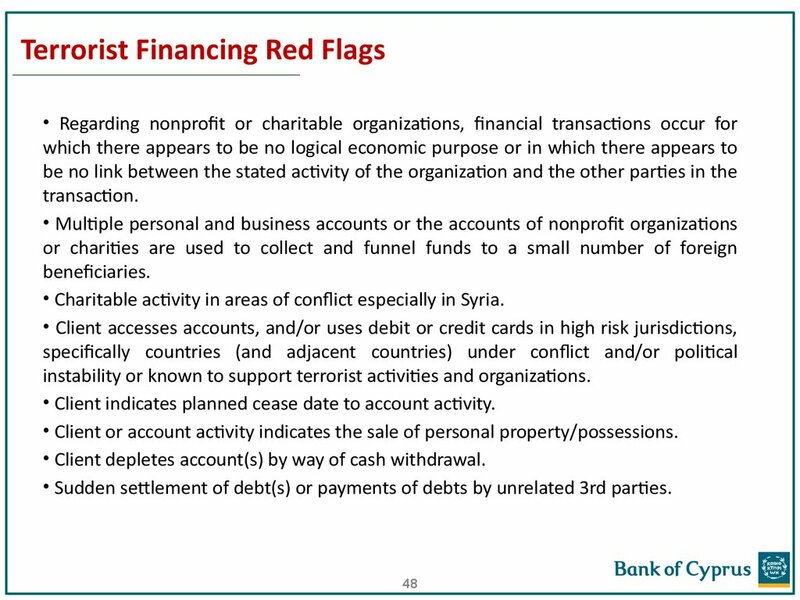 • Client indicates planned cease date to account activity. 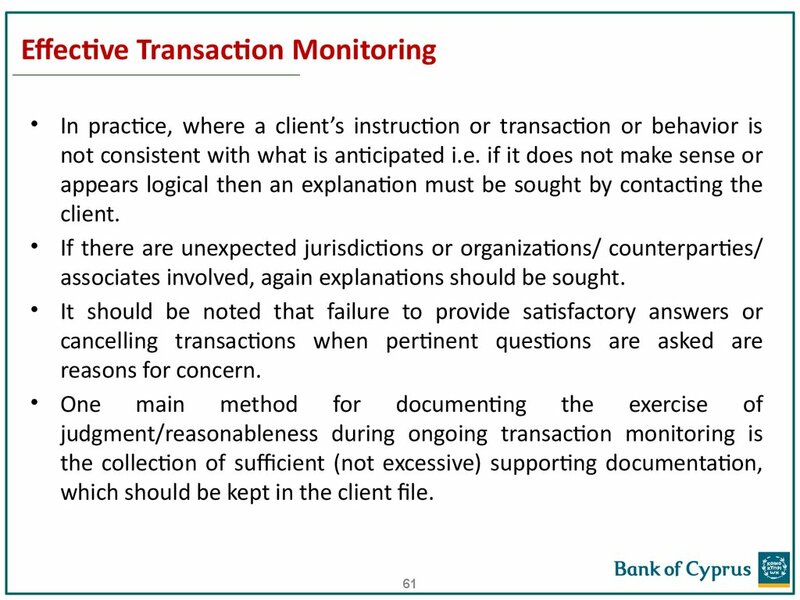 • Client or account activity indicates the sale of personal property/possessions. 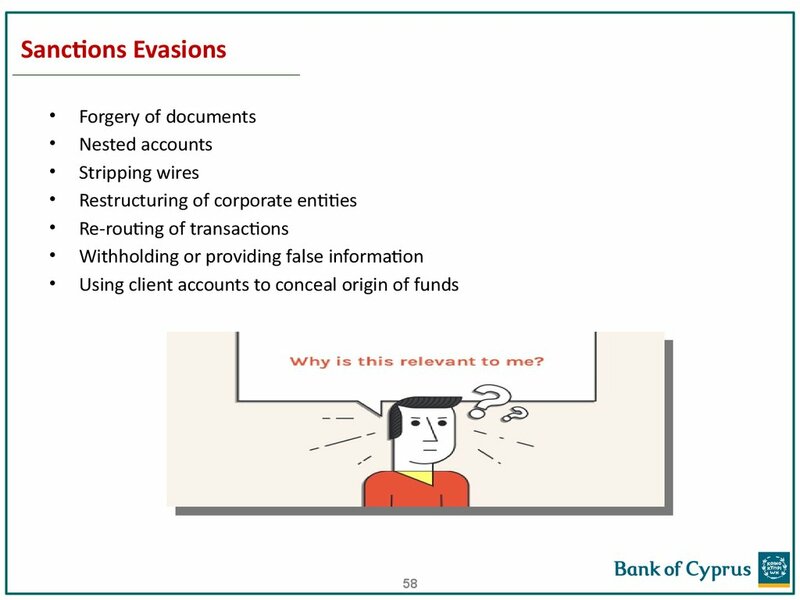 • Client depletes account(s) by way of cash withdrawal. 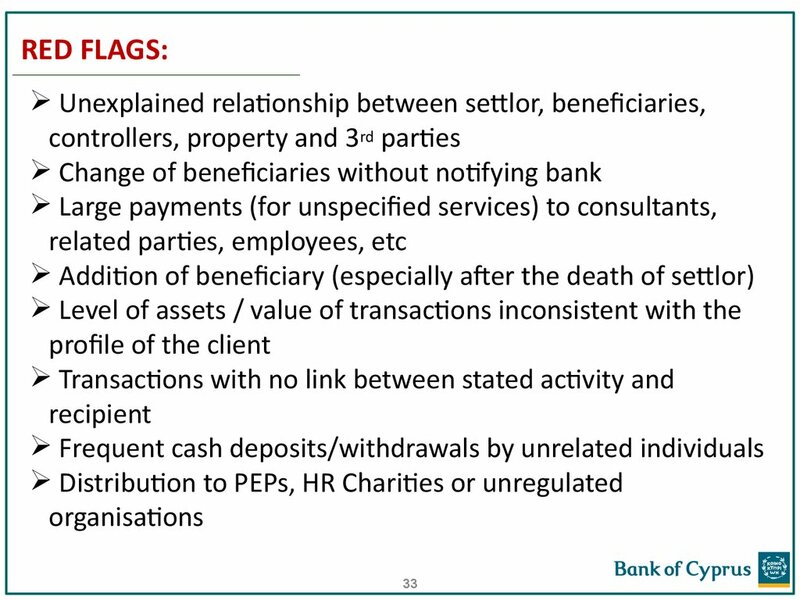 • Sudden settlement of debt(s) or payments of debts by unrelated 3rd parties. 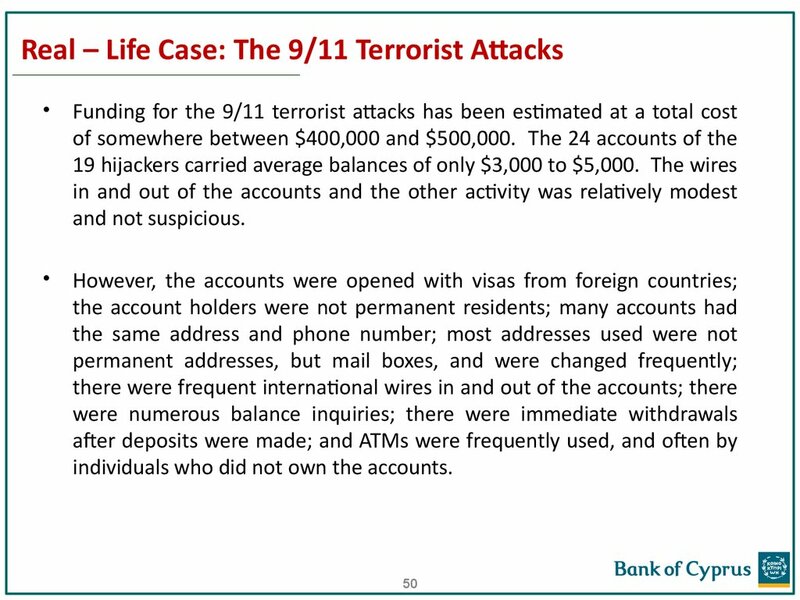 individuals who did not own the accounts. 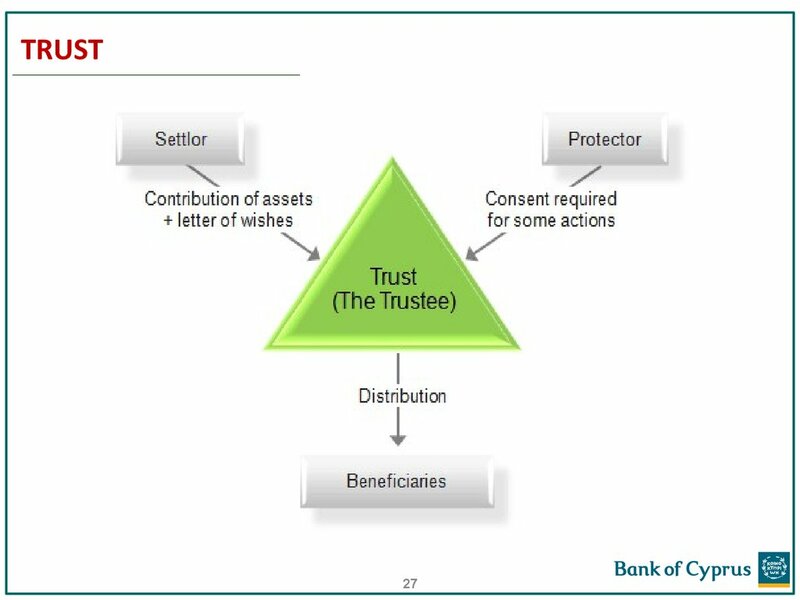 • to influence their actions. 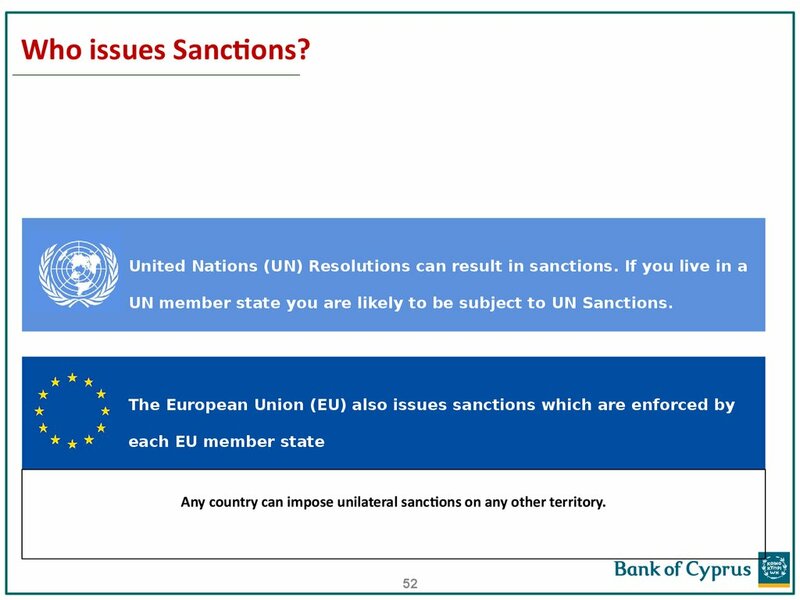 UN member state you are likely to be subject to UN Sanctions. 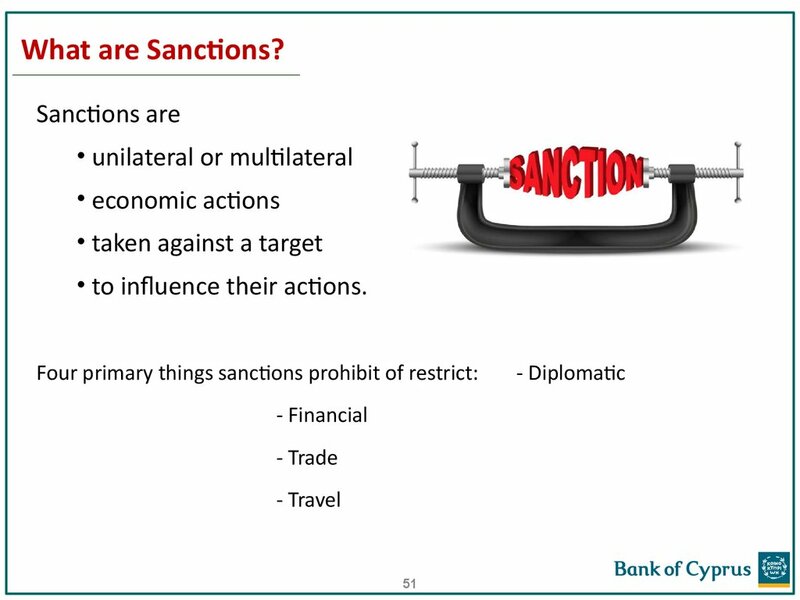 Any country can impose unilateral sanctions on any other territory. 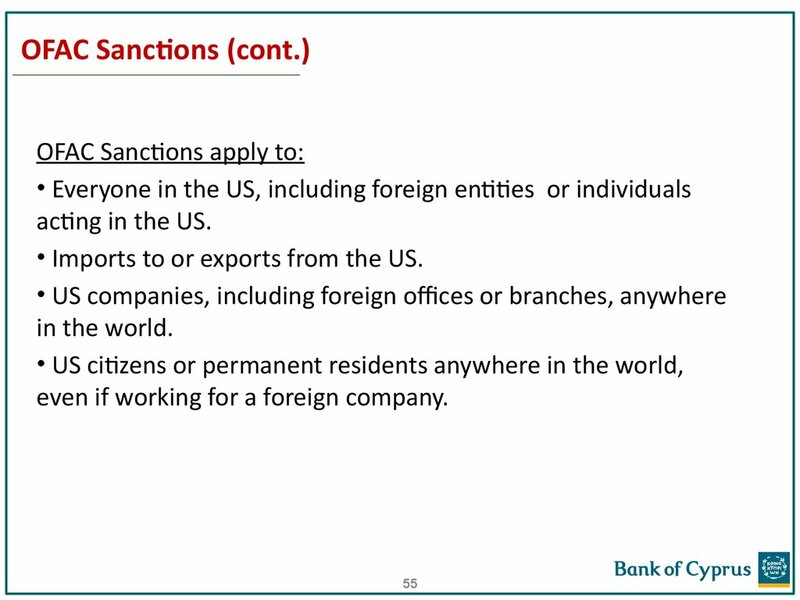 • Sanctions are then enforced by Member States. 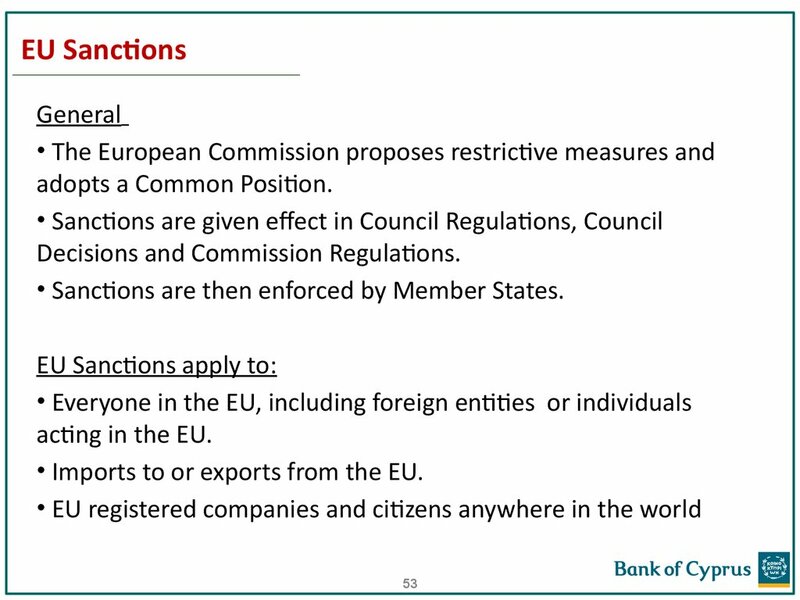 • Imports to or exports from the EU. 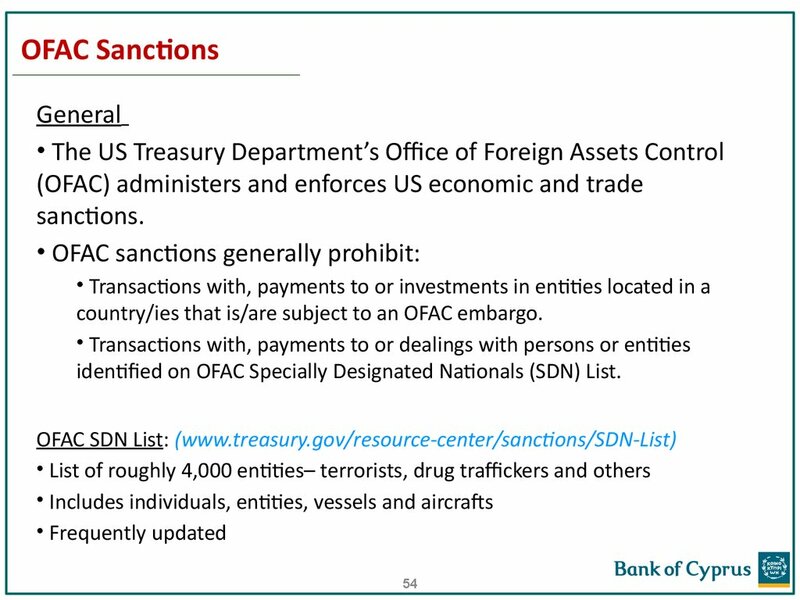 country/ies that is/are subject to an OFAC embargo. 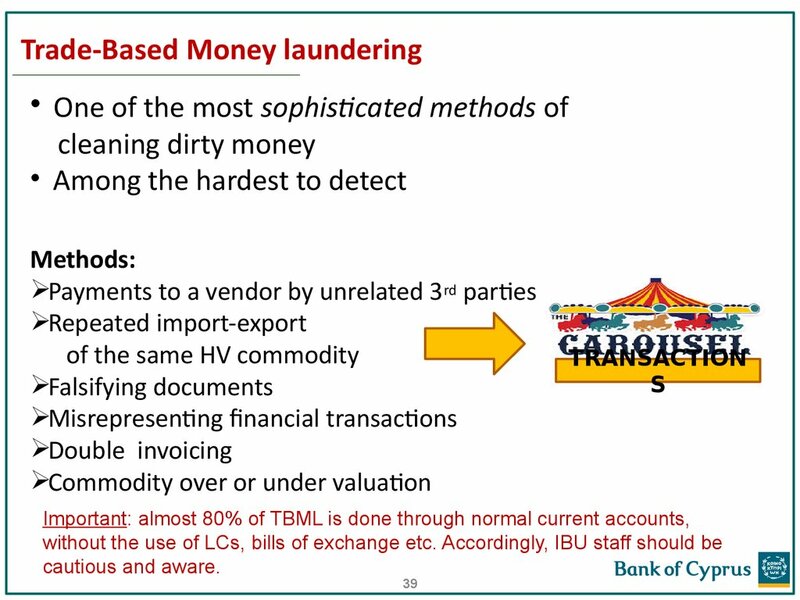 identified on OFAC Specially Designated Nationals (SDN) List. 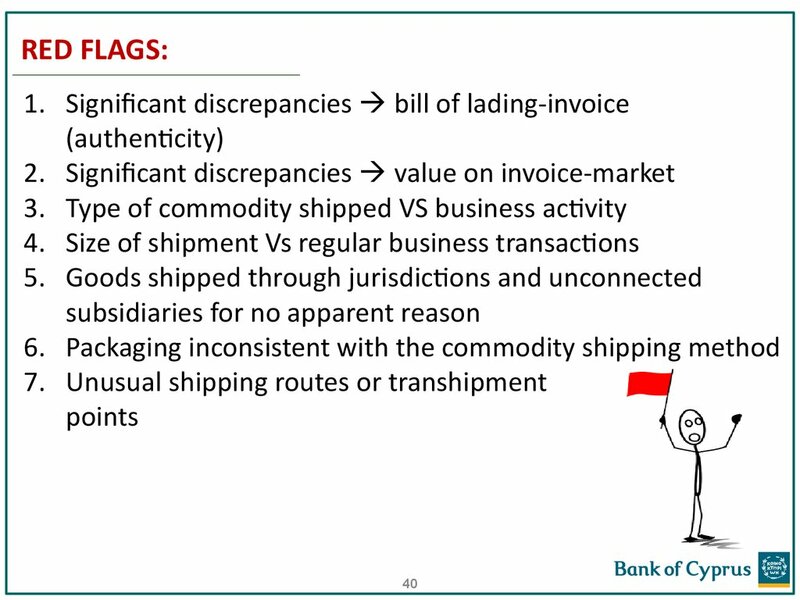 • Imports to or exports from the US. even if working for a foreign company. 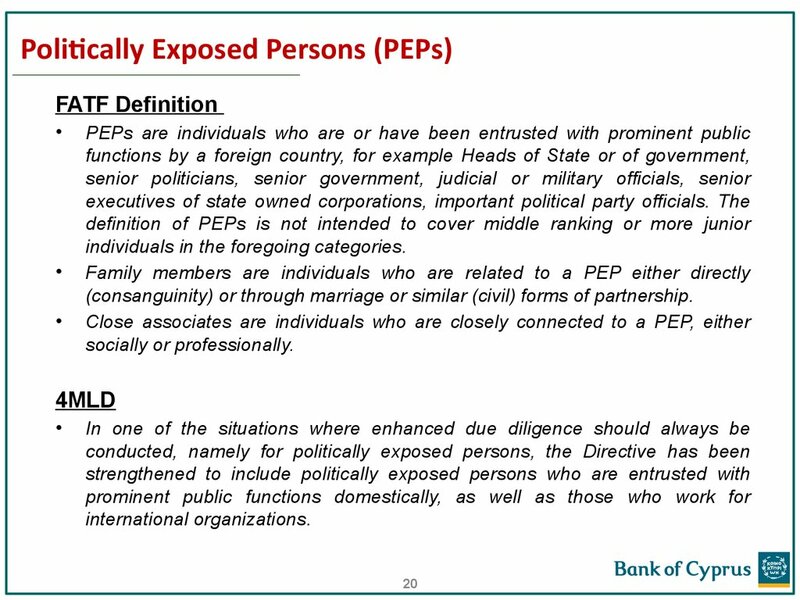 associates involved, again explanations should be sought. which should be kept in the client file. basis throughout the life of the relationship. 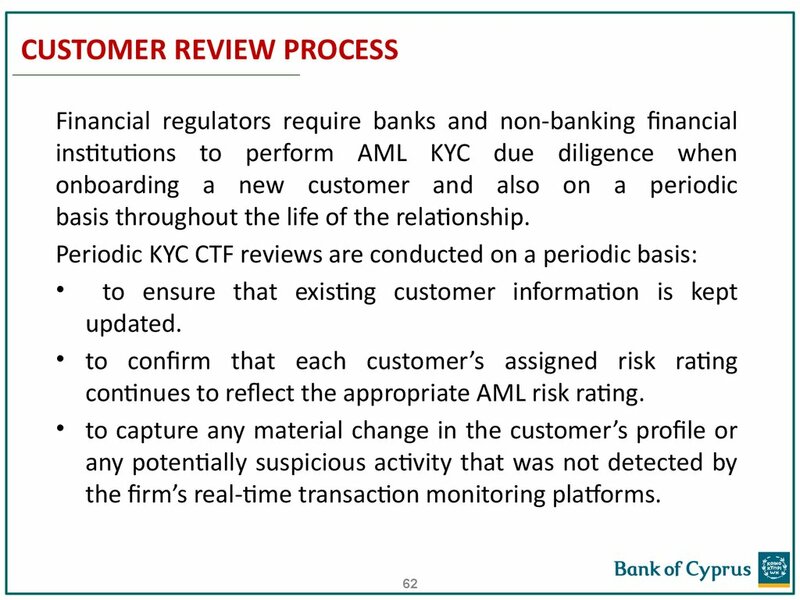 continues to reflect the appropriate AML risk rating. 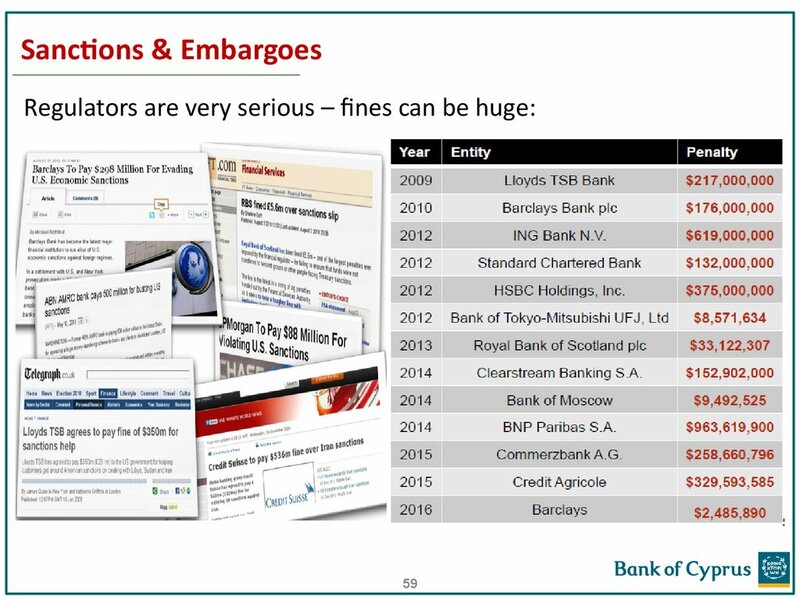 the firm’s real-time transaction monitoring platforms. 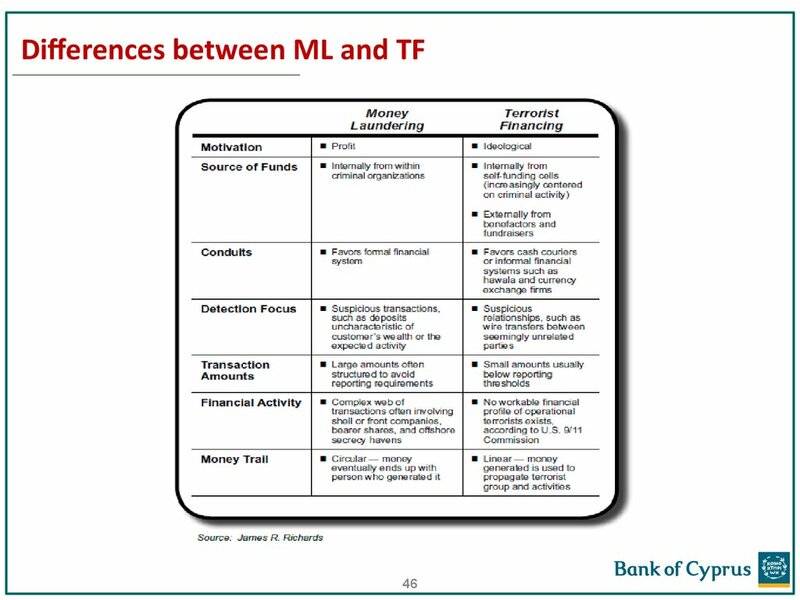 Bank’s real-time transaction monitoring platforms. terminating the relationship, closing any accounts, filing a suspicion report. 67. 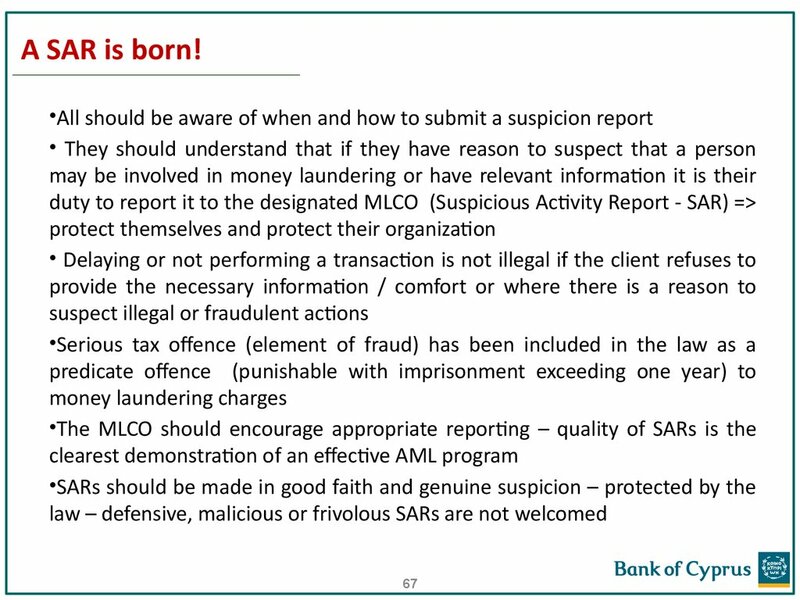 A SAR is born! 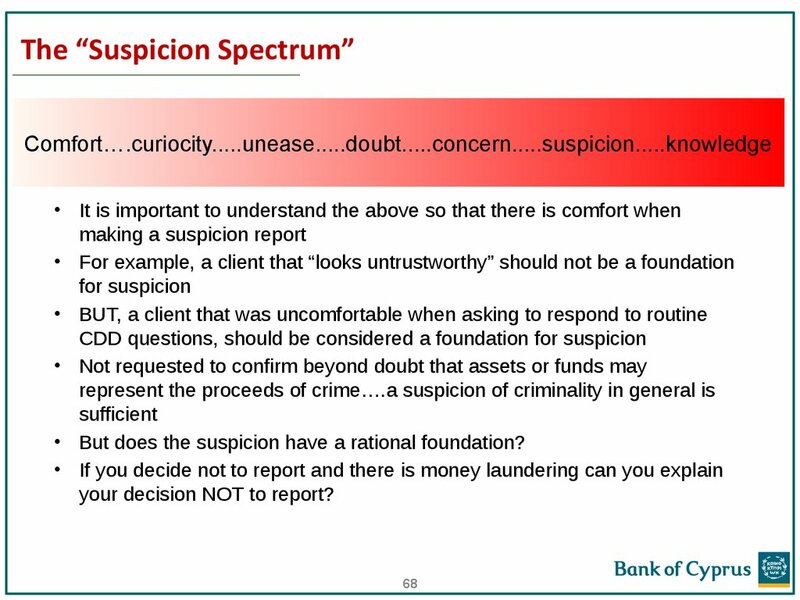 • But does the suspicion have a rational foundation? your decision NOT to report? 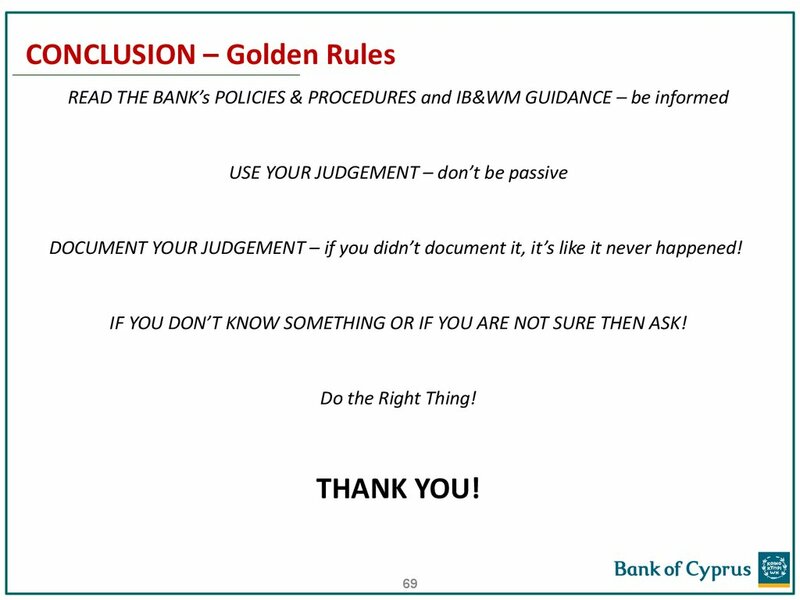 DOCUMENT YOUR JUDGEMENT – if you didn’t document it, it’s like it never happened! 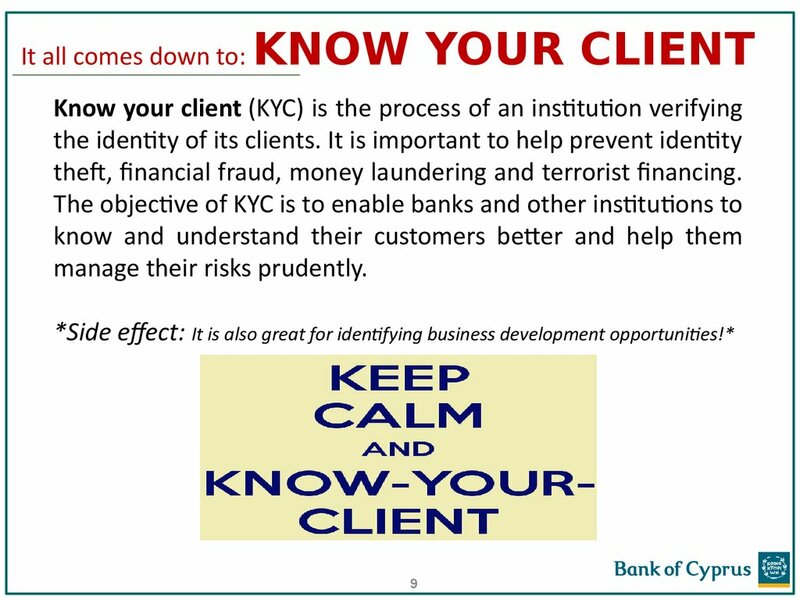 IF YOU DON’T KNOW SOMETHING OR IF YOU ARE NOT SURE THEN ASK!